A is also for asleep. Bella flat on her back like she's human. And princess pooter snuggled up there with daddy. Yup that furry thing near his pillow is Ewok. Do you have dogs or cats, or any pet for that matter, sleeping in your bed? I don't think I ever saw anyone sleeping with their legs pointing up, very cute dog. I have one kitty and he does not like to sleep on my bed. 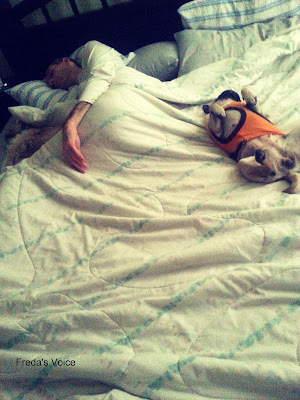 From some of the stories I've heard of bed-sleeping animals, I may be lucky. That photo is too cute! I do have 3 dogs one cat, and sometimes (on those mornings) that I could sleep in, if only they would let me!!! Of course our blind dog, stays pretty much in the living room, but if she could and when she can, she's right there too! I love that boneless, worry-less, intense sleep! It would be nice to find that again, wouldn't it? 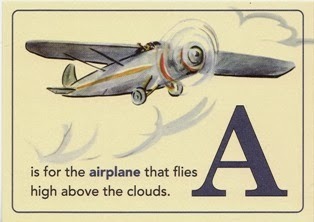 Thanks for an amazingly neat photo for Alphabe-Thursday's letter "A".